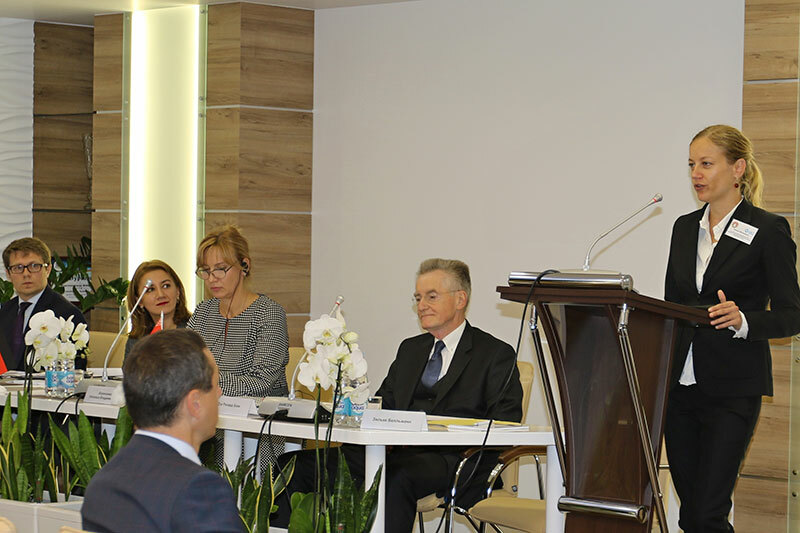 On 15 March 2019, the IRZ, together with the National Centre of Intellectual Property of Belarus (NCIP), organised a conference on copyright law and copyright collectives in Minsk, Belarus. This followed on from the event on trademark and patent law, which took place in Minsk in November 2018. The German expert speakers at the conference were Dr. Oliver Schön, a judge at the Regional Court of Munich, and Oliver Drews, a senior civil servant at the German Patent and Trademark Office (DPMA). The participants from Belarus included the National Centre of Intellectual Property and representatives from the Collective Management Centre at the NCIP. Also taking part in the conference were a judge from the IP Senate at the Supreme Court, lawyers specialising in copyright law, media representatives from the press and radio and people from the community who are concerned by copyright, such as photographers, designers and composers. The German expert contributions focussed on the legal enforcement of copyright claims in Germany, which were described and discussed using practical case examples, as well as the function and activities of copyright collectives, their rights and obligations in Germany and how these are supervised by the DPMA. Short lectures by the Belarusian experts explained the copyright law in Belarus and how this is protected by the courts, as well as the structure of the collective management of copyright and how this works. Other subjects discussed included the charging of fees for private copies in Belarus and the organisational problems associated with this. The expert lectures provided a good insight into the legal enforcement of copyright claims in Germany, the activity of copyright collectives and the supervision of these collectives. During a lively exchange between the Belarusian and German participants, sample copyright law cases from German legal practice were animatedly discussed. The scope of activity of the German association for Musical Performaning and Mechanical Reproduction Rights (GEMA) also met with great interest. The high number of participants and the very active involvement of almost all the 70 attendees were proof that the topics selected for discussion at the conference were highly topical and of great interest. After a break of several years in the cooperation, the dialogue with the Constitutional Court of Belarus was resumed in September 2017, once expert meetings on law on lawyers, notarial law, case law and bailiffs had already taken place. The meeting held with the Constitutional Court of Belarus in Minsk at the end of September was to discuss the “Protection of fundamental rights by the constitutional court.” On the German side, the German Ambassador Peter Dettmar, Prof. Dr. Udo Steiner, a former judge at the German Constitutional Court, and Jes Möller, President of the Constitutional Court of the State of Brandenburg, took part in the conference. During discussions with the Vice-President of the Constitutional Court of Belarus, Natalia Karpovich, issues concerning the role of the constitutional court within the structure of constitutional bodies and the indirect and direct access of citizens to the constitutional court through constitutional appeals, judicial reviews, constitutional disputes between government institutions etc. were discussed. 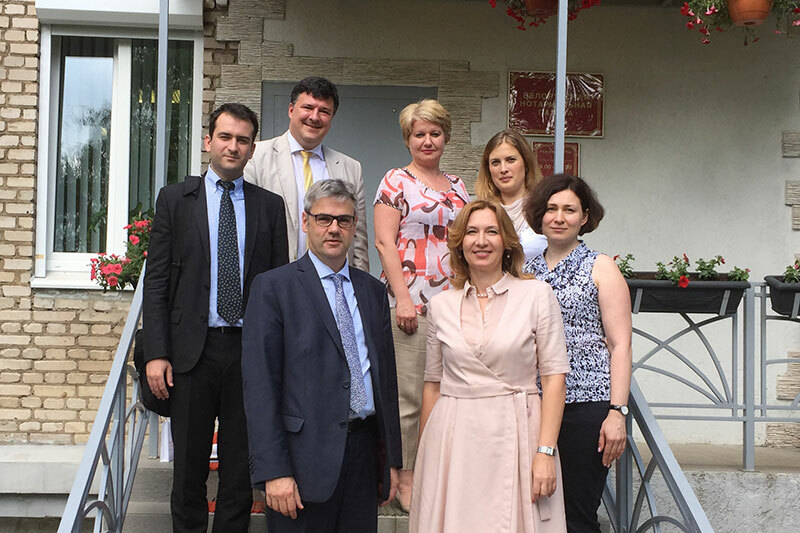 From 11 to 16 September 2016, the IRZ organised a working visit by Belarusian lawyers to various judicial institutions and non-governmental organisations in Berlin and Cottbus for intense expert discussions on the subject of women's rights. One priority of the working visit was to provide information on the legal regulations for protecting women against domestic violence, discrimination based on gender and at work and on guaranteeing social and economic rights. In Belarus, there are no legal provisions for domestic violence against women. During the visit, the Belarusian delegation expressed the wish to establish in Belarus a similar system to the one that exists in Germany. To begin their visit, the Belarusian delegation visited the Regional Court of Cottbus. The President of the Court, Ramona Pisal, welcomed the guests to discussions, which took place in a very open and trusting atmosphere. This was followed by talks at the Local Court in Potsdam on the special features of divorce proceedings, the allocation of assets during a divorce in Germany and on denial of custody. Another venue for the working visit was the German Association of Female Lawyers. Here, the Protection against Violence Act in Germany was discussed, with a focus on its practical implementation. Equality between men and women in the workplace was also discussed. An active exchange also took place with the German Federal Bar (BRAK). The subjects of discussion here were the duties of female lawyers in Germany and the general role played by lawyers in the German legal system. With the Berlin Senate for Work, Integration and Women, the guests learned about how the position of women in German society has changed, the reforms that have been carried out and the measures that still need to be taken. An informative and comprehensive exchange of experiences also took place with the Berlin Initiative against violence against women (BIG e.V.). It was particularly important to members of the Belarusian delegation to learn about the methods that can be used to protect women against domestic violence. The penultimate stop on the working visit was at the penal institution in Luckau-Duben, to learn about the special features of women’s prisons. Afterwards, the delegation was hosted by the Heinrich Böll foundation [https://www.boell.de/] in Berlin. 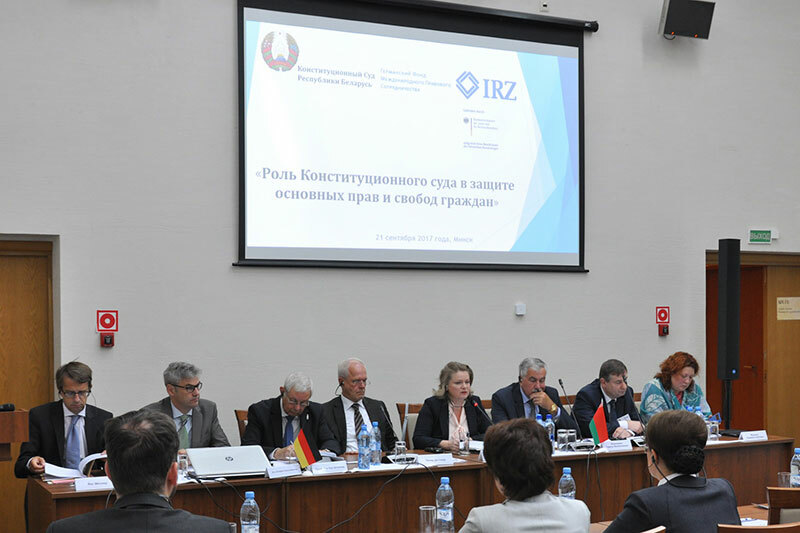 On 18 September 2017, the IRZ together the Chamber of Notaries of the Republic of Belarus and the German Federal Chamber of Notaries organised a conference in Minsk on “The role of the notary in preventive justice, particularly in company law”. From the German Federal Chamber of Notaries, the Vice-President, Notary Richard Bock, and Dr. Vladimir Primaczenko took part in the meeting. 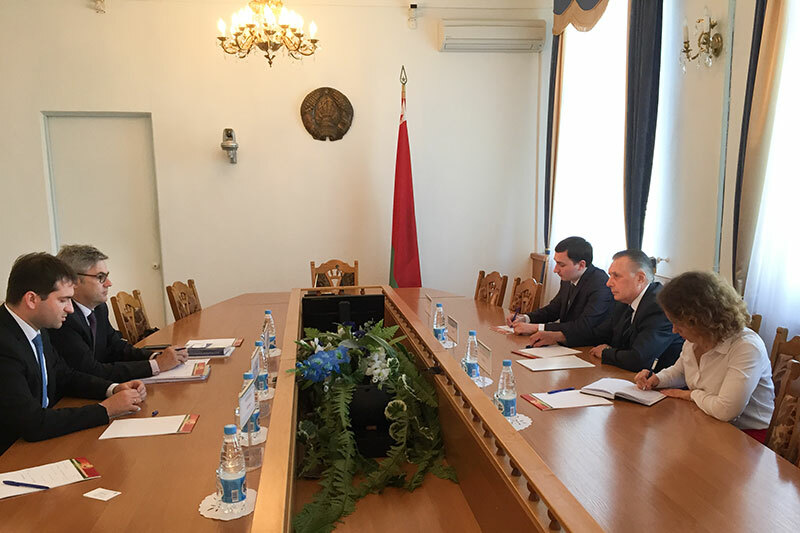 The renewal of the cooperation with the Republic of Belarus was warmly welcomed by the President of the Belarusian Chamber of Notaries, Natalia Barysenko. She underlined the importance of this support for the further development of notarial law. The Chamber is aiming to join the UINL (Unión Internacional del Notariado). The IRZ would like to continue supporting this process as much as it can, with experts from the German Federal Chamber of Notaries, and to accompany further reforms. 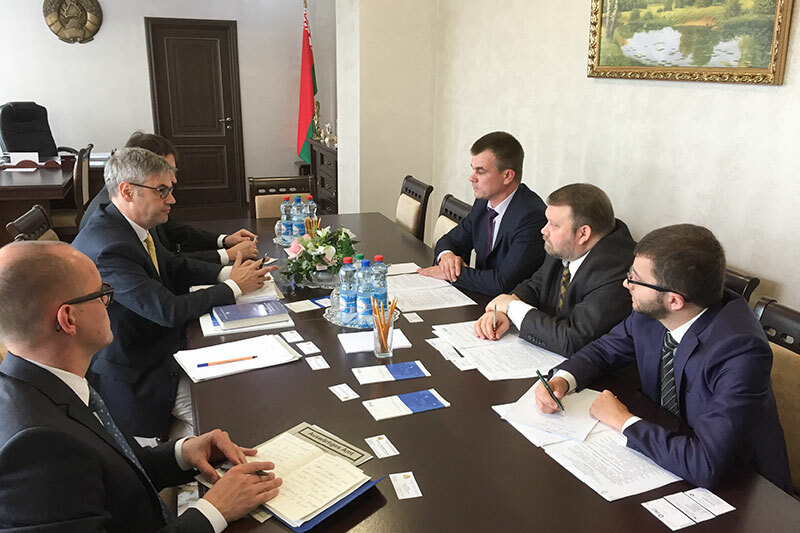 From 20 to 23 June 2016, the Deputy Director of the IRZ, Dr. Stefan Hülshörster, and Head of Section, Stefan Mironjuk, stayed in Minsk at the proposal of the German Federal Foreign Office to hold talks on the potential for renewing the cooperation with Belarus. Ewgenij Kovalenko, Director of the National Centre of Legal Information. At the Belarus Lawyers’ Association and the Centre for Mediation and Law, the talks with Professor Victor Kamenkov were mostly on the subject of mediation. 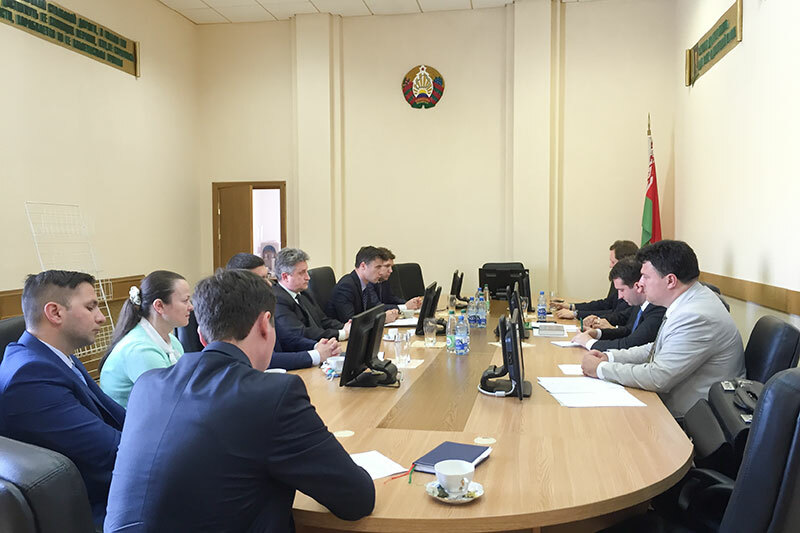 At the Notary Chamber of Belarus, the delegation met the President, Natallia Barysenka, and her fellow board members, who showed an interest in the subject of the notarial certification of real estate businesses and the duties of notaries in corporate law during discussions with their German colleagues. 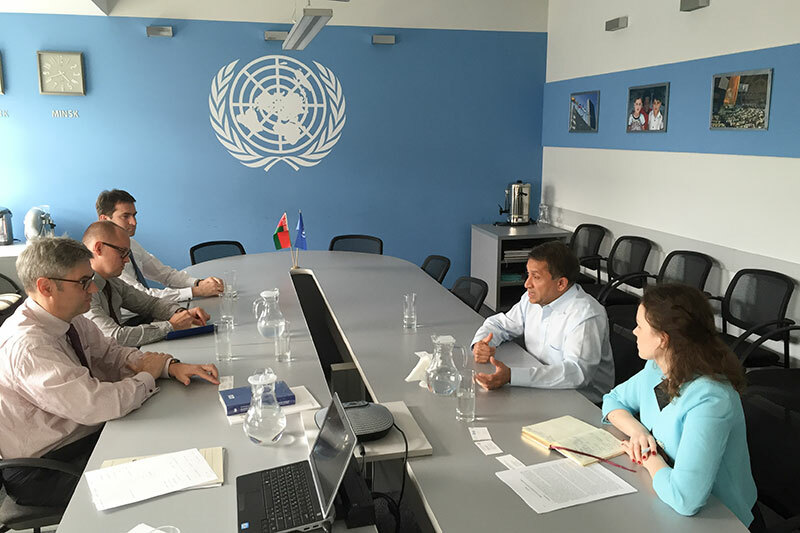 The UN Resident Coordinator in the Republic of Belarus, Sanaka Samarasinha, invited the IRZ to participate in the UN initiative “Access to Justice and Rule of Law” in Belarus. The talks went ahead in an open, cooperative atmosphere and were well-prepared in advance thanks to the support of the German Embassy and the Ministry of Foreign Affairs of Belarus. All potential partner institutions showed a keen interest in renewing the cooperation with the IRZ. The topics of legal techniques and regulatory impact analysis, mediation and data protection laws and laws relating to lawyers and notaries were identified as possible subjects for the first expert discussions. After the summer break, a working programme for 2017 will be devised.